The island of Taiwan, meaning ‘terrace bay’, lies 120 kilometers off the southeastern coast of mainland China, across the Taiwan Strait, and has an area of 35,980km². It is surrounded by the East China Sea to the North, the Philippines Sea to the East, and the Luzon Strait to the South. and Hakka) who are descendants of Chinese who came to Taiwan during the 17th and 19th centuries (84%).Taiwan, whose official name according to the Constitution is the Republic of China (ROC), is a multiparty democracy seeking full participation in international forums such as the World Health Organization and ultimately membership in the United Nations. Since 1991, the Government of Taiwan has renounced its claim to represent all of China, stating that instead it represents the people of Taiwan. Taiwan’s main concern remains its difficult relations with the People’s Republic of China (PRC), which claims that Taiwan is part of its territory and that it has the “right” to use force against Taiwan whenever it sees fit. Taiwan is well known around the world for its successes first in economic development, and more recently in democratisation. As it currently stands, Taiwan has the largest and most prosperous economy along with having the highest population of any country outside the UN. As a result of its exclusion from the UN and from other international organizations, coupled with the threat posed by China, it remains in a precarious state in the international arena, which prevents the Taiwanese people from being able to fully enjoy their newfound prosperity and human rights. 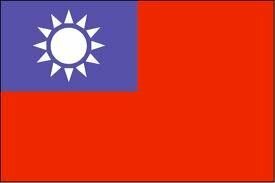 Just after the Communist Revolution in China in 1949 and the consequent withdrawal of the Nationalist Party (often referred to by its Chinese name, Kuomintang, or the short form KMT) to Taiwan, the country endured 38 years under a military rule headed by Chiang Kai-shek and his son. Starting from 1987, Taiwan’s political system began to liberalize and enter a democratization process with the formation of the Democratic Progressive Party (DPP) in 1986 as the first genuine opposition party. Among other issues, the party advanced the right of self-determination for the people of Taiwan, thus resurfacing the issue of the political status of Taiwan, a previously taboo question. Despite the severe pressure and military threats from the PRC, the Taiwanese government held their first direct presidential election in 1996, re-electing Lee Teng-hui of the KMT. The DPP received 44% of the votes in the legislative elections of 1997 and the second direct presidential election of 2000 saw the victory of DPP candidate Chen Shui-bian, bringing about the first transfer of executive power away from the KMT. In 2004, President Chen Shui-bian was re-elected for a second (and last, under the constitutional limits) presidential term, however later the same year the DPP failed to gain a majority in parliamentary elections. In recent years, there has been an increased polarization of politics in Taiwan between two main political camps, the Chinese Nationalist Party (KMT) and its allies (the so-called Pan-Blue Coalition) the Democratic Progressive Party (DPP) and its allies (the so-called Pan-Green Coalition). The polarization in political thought derives from opposing stances based on the Pan-Blue Coalition and Pan-Green Coalition’s differing interpretations on the 1992 consensus that was reached with the PRC. This consensus plays a key role in the understanding of the “status quo” between the PRC and ROC. The consensus is based on a mutual understanding on the ‘One China Principle’ whereby both the PRC and ROC recognize that mainland China and the island of Taiwan belong to the same China. However, the interpretation of what that means and more importantly, who is the one legitimate government, is decided by each side’s own definition. The main contention is that while the KMT and the Pan-Blue Coalition believe this consensus exists, the DPP and the Pan-Green Coalition maintain that it does not. The DPP argue that as there was no mutual agreement on the terms of what China was, and which of the two governments would be the legitimate ruler, no consensus had been reached. In the 2008 presidential elections, Ma Ying-jeou from the KMT was elected with an electoral program based on establishing a ‘diplomatic truce’ with the PRC. In his inaugural speech, Ma Ying-jeou stated that he would resume talks with the PRC based on the shared understanding of the consensus. This began high-level talks about agreements on trade and travel, which included the first direct flights from the ROC to the PRC in July 2008. Cross Strait relations continued to develop under the presidency of Ma, with 16 agreements being signed to benefit people on both sides in the three years of his first term. Relations grew closer after Ma Ying-jeou’s re-election in 2012, signified by the first meeting between each head of state across the Strait since 1950, which took place in November 2015. Despite the progressive normalization of the situation, the PRC’s military buildup across the Taiwan Strait remains a major concern. Since the 1990s, when Taiwan renounced its claim to represent mainland China and decided to pursue its own political identity, the extent and quality of Chinese armaments explicitly deployed for a conflict over Taiwan has only increased. For example, as estimated by the US Annual Report on military expenditures from PRC, 50 more missiles are deployed targeting Taiwan every year, and now there are probably over 1,300 deployed in the region. These forces have been used to intimidate Taiwan notably in 1995 and 1996, when unarmed M-9 ballistic missiles were launched across the Taiwan Strait. In the 2016 presidential election, Tsai Ing-Wen from the DPP was elected as the first female President of the ROC in a landslide victory. The DPP stance on Cross Strait relations is that Taiwan and all its associated islands are already independent, making a formal declaration of independence redundant. Tsai maintains that the issue is of such importance that it necessitates an approach that incorporates all of the Taiwanese population; therefore, she wants the main focus in talks to be about ‘maintaining the status quo’. However, each party has different ideas about the nature of the status quo. Approaching talks with the thought of Taiwanese independence means that the DPP and Tsai want to create awareness and understanding of Taiwan as a politically distinct entity leaning towards independence rather than reunification. A month after becoming President, Beijing suspended communication with Taipei. While this is the case, Beijing has maintained cooperation in economic, social and cultural spheres. Tsai has stated that her Cross-Strait policy is based on the preferences of the majority of the people of Taiwan who want favourable relations with the mainland but who do not, according to Tsai, accept the 1992 Consensus. Taiwan is represented at the UNPO by the Taiwan Foundation for Democracy (TFD). Taiwan is a founding member of the UNPO having joined the organization on 11 February 1991; TFD has served as Taiwan’s representative since 2006. 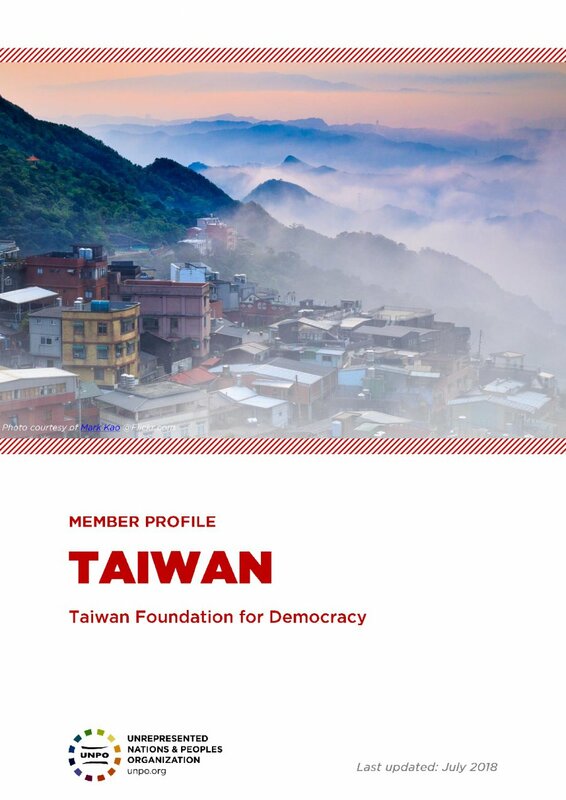 The TFD is the first democracy assistance foundation established in Asia and is devoted to strengthening democracy and human rights in Taiwan and abroad. Its primary missions are to further consolidate Taiwan’s democratic system, promote democracy in Asia, and actively participate in the global democratic network. The TFD puts its ideals into practice through transparent and non-partisan management. Building on the strength of political parties and civil society, the TFD enables Taiwan to positively contribute to the worldwide movement for democracy. UNPO believes that Taiwan should be allowed to fully participate in the United Nations, as well as all its specialized agencies. Denying Taiwan’s international recognition is preventing Taiwanese people from their right to self-determination and thus constitutes a violation of international law. A non-violent and democratic solution to all disputes with People’s Republic of China (PRC) must be both countries’ priority; therefore, UNPO condemns the permanence and increase of Chinese military presence in the Taiwan Strait as well as the Anti-Secession Law (2005), that purport to grant China the right to use force against any attempt of independence coming from Taiwan. UNPO commends Taiwan’s government democratization efforts and its work in contributing to a flourishing democratization of the Asia-Pacific region. UNPO also welcomes the country’s attempts to embrace its indigenous peoples and to build a more inclusive and open society. Please download our Taiwan Member Profile Brochure.